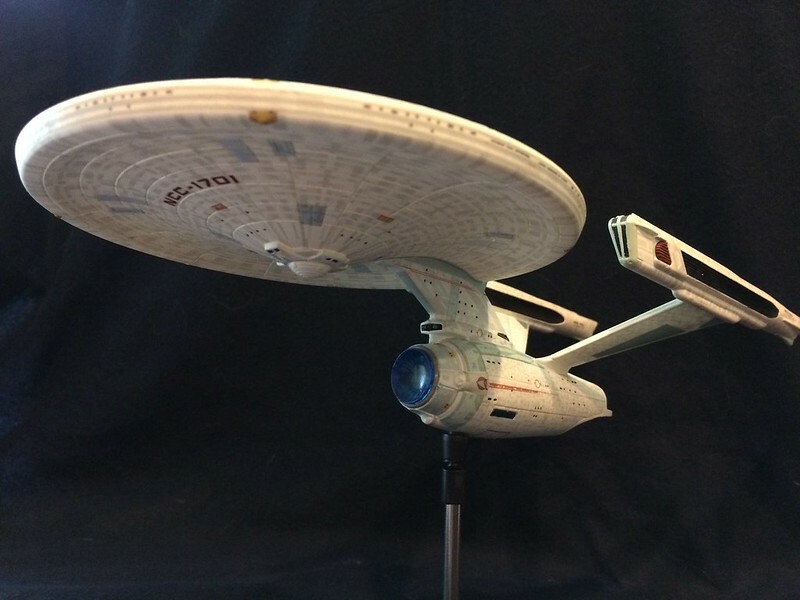 SciFi Model Action - Modeling Questions Board - Model Kit Builders Guides - Paint for the 1/537 Reliant. So, I'm to the Point of painting my Reliant. I plan to use an airbrush for this. Can anyone tell me the formula and approximate amounts of which colors to use for the main color? That is to say, starting off with regular white, add two drops of black, and 3 drops of blue.... Or something along those lines. I also need to know now much paint is going to be needed to finish the whole model and have some to spare. Re: Paint for the 1/537 Reliant. 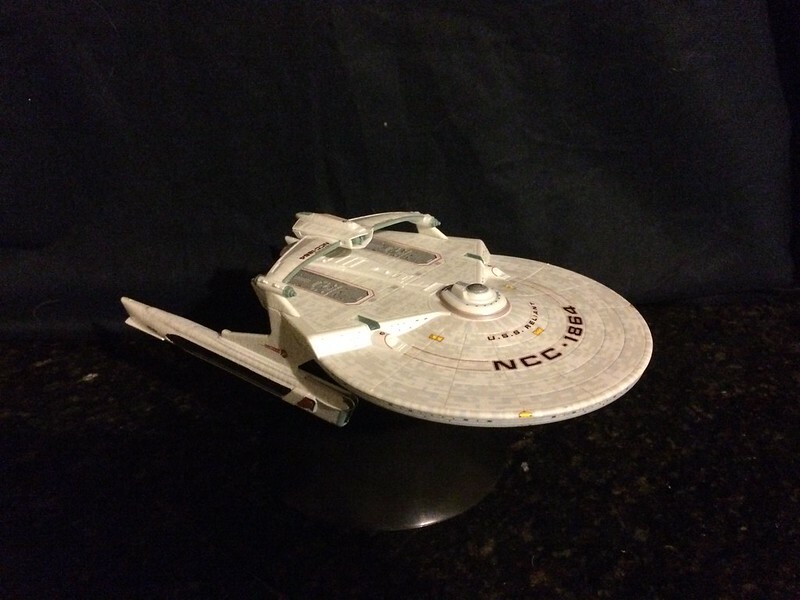 What I usually do with my starfleet ships is hit them with white primer, then a coat of pearl white from Tamiya. Once the decals are laid on top of this, it gives it that shimmering effect that you get from the films. That sounds pretty sweet. I'll look into the pearl paint. Here's my latest 1:1000 Refit and 1:1000 Reliant using primer/pearl white + round2 decals. In reality, whenever the light hits them right you get that pearl look. It works nice! Most here use the Duplicolor Adhesion Promoter, which you can find at just about any auto store like O'Reilly's, Auto Zone or Advance Auto Parts. The Tamiya Pearl is a rattle can and you should be able to get it at a hobby shop if they sell the other Tamiya paints. Same with the Tamiya White primer if you use that. Thanks Dan. I actually bought the promoter a few weeks ago but need to get the white primer, which is a great idea. My plan is to mix my own paint and airbrush the model. I've never used an airbrush before. I guess it would be the equivalent to jumping in a flying jet and trying to land it with now lessons. Hopefully the result won't be quite so painful. I'm pretty sure I can do this. I've just been stalling doing the other little stuff until I get my nerve up enough to take the painting on. I'm kinda running out of smaller stuff to do at this point. The painting is sort of the next step unless I want to spend my time masking off LED's. Dive into the airbrush Shawn! I just started last year after 40 plus yrs. without. It's a game changer bro. As a relatively new airbrush user I can say have lots of patience, test your psi and paint mixtures on some spare parts first, and don't get too frustrated if you muck up and have to strip something and repaint. Maybe it's just me but it took me two kits to figure out the correct parameters for getting a smooth coat for primers, paints, and varnishes. Thanks fellas. I'm trying it for the first time tonight. Very tricky process for sure. Not sure I'm liking it at this point. If I used solvent based paint, like automotive paint, can it be stored in tupperware, or will it eat that kind of plastic? Also, I was having splattering issues, but I reduced the psi down to 20 and it seems to be working better now. A bit late but since no one has answered... Automotive thinner is extremely aggressive and will attack the weak plastic of food containers. Better is to store it in glass jars or tin cans. I am not saying that such paint cannot be stored on plastic cans, only that the general use stuff is not appropriated for this finality. On a side note, personally I don't save prepared paint for reuse (I use enamels) because usually when I try to use them months later they got thick/kind of rubberized and a second time thinning usually doesn't works for me. Since it's not rare that I have clogging issues with my airbrush I prefer not to play with it. Anyway, normally I prefer to dispose not used paint and when I need to repeat a similar project I prepare a brand new mixture. Good advice. Thanks 1966. I'm still a few months out from working on the ships anyway.